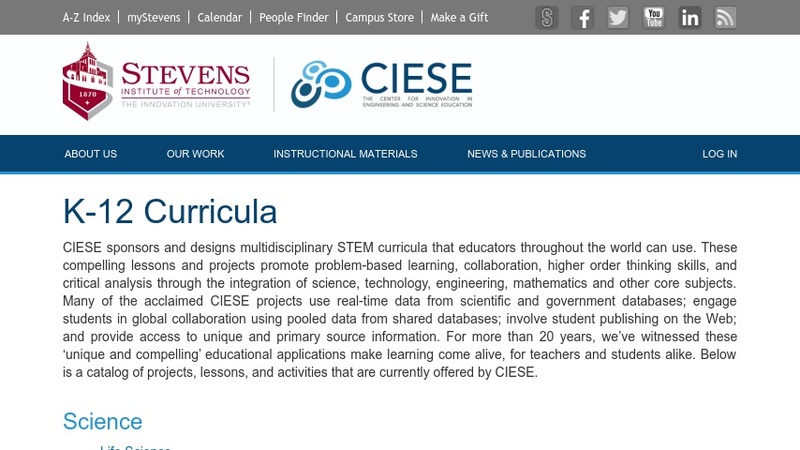 The Center for Innovation in Engineering and Science Education (CIESE) at the Stevens Institute of Technology "sponsors and designs interdisciplinary projects that teachers throughout the world can use to enhance their curriculum through compelling use of the Internet." Using real-time data available from the Internet, teachers and students can collaborate on projects "that utilize the Internet's potential to reach peers and experts around the world". Some projects that are currently being or have been sponsored by CIESE include collaborative projects analyzing genetic data, a series of activities that uses census and demographic from the U.S. Census Bureau to explore the mathematical and environmental aspects of population growth, and hands-on activities and real-time data investigations to study factors that affect weather and climate. Each project has a brief description and includes links to the National Science Standards and NCTM math standards that it supports. The About Us section includes some papers written, mostly by CIESE staff, about CIESE efforts.